The tomato went into “the summer side dish”…also known as the recipe without a name! I thought about calling it the Chickpea, Corn, Cucumber, Tomato, and Garlic Salad…but that’s just a mouthful. Summer side dish will have to do! 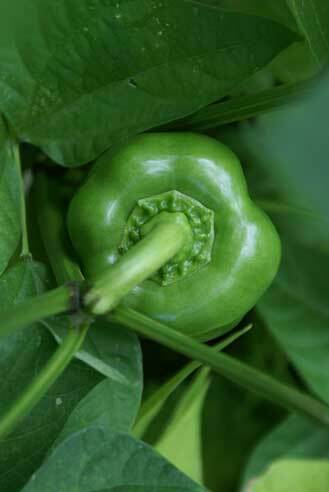 There’s a shot of my green pepper…aerial view. 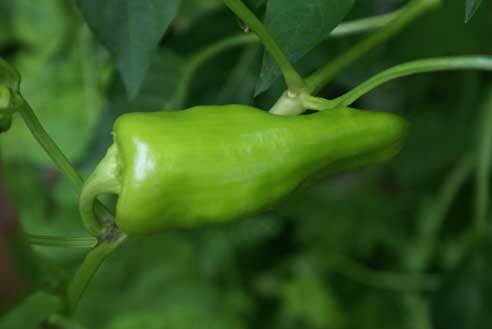 And 1 of 5 cubanero peppers that have grown in now. And yes, it is sitting sideways on the plant. I did not forget to rotate that picture! The branch this pepper is growing on has taken a bit of a dive…so the pepper is now laying on its side. Because I’d like to use the pepper in some salsa once more tomatoes ripen, I’m thinking I might have to pick these and freeze them. 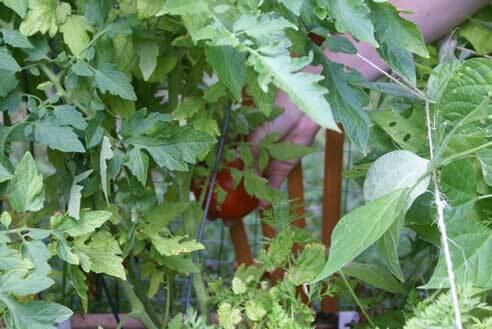 There’s me…picking that first tomato! Me again! Thrilled to have my first tomato of the season…with many more to come! There are quite a few cherry tomatoes that have turned red…I’m just waiting to pick them until there are enough to use in a pasta salad…likely mid-week! Anyone have any garden updates…I’d love to stop by to see picts!!! Leave a link! I need to take some new garden pics. 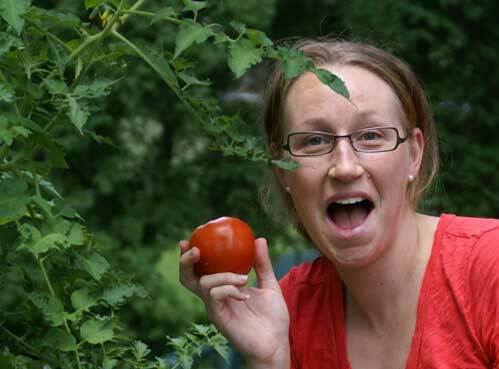 I don’t blame you for being excited about your tomato! And your peppers look great. All the leaves fell off my green pepper plants and there’s only a stem and a couple of top leaves. Only got one tiny pepper. I have no idea why that happened. That is great! Gardens are so much fun. I wish I would have known you were doing this on your website. I have all the books on square foot gardens, read all to prepare, but never seem to get it going when it is season to plant. I need to just go ahead of plan the gardens and put in what I can for next planting time. No Connie…a little south of Canada…SW Ohio to be exact! It’ll be a while before the other tomatoes are ready! This one was an early bloomer! I frequently put pics of my garden in my blog; as well as our new source of milk, Bonnie. I have been visiting your site for a few days, and I love it! You have so many great ideas. I noticed that this is an update of your ‘square foot garden’. I was just curious how you got that name. I cant wait until I get my zucchini. There are flowers, but no squash yet – we planted a bit late. I am also hoping for a few beans too, I did manage to get some flowers. This is the first year we have planted a ‘ghetto garden’ in pots in the backyard because we have so little space. We only planted a few things, but it is going well and I cant wait to eat it all! Your garden looks GREAT! So jealous of the little tomato. I seriously cannot grow those little buggers! I couldn’t wait on my first red tomato . I had to have me some fried green tomatoes . :) And they were soooo good . Bye-the-way what kind of camera do you have .Your pictures are great . ahh so jealous! We had 21 days of rain in June, here in southeastern PA, so there weren’t enough sunny days and my tomatoes are still green and tiny. And my peppers…nothing 🙁 But I guess I’ll just live vicariously through your garden victories! Wow! I can’t believe the size of your tomato plants and they look so healthy! What a green thumb! How wonderful that you’re reaping the benefits of your garden! It’s a wonderful feeling to watch the plants grow from the ground up, and then see the fruit of our labors in the form of…fruit! And veggies, too. 🙂 Thanks for posting your pics. We’re doing an organic garden this year, and it has turned out to be a HUGE success, considering all the other gardens we tried (including containers) didn’t do too well. But we’ve put more effort into this year’s garden, and took more steps to ensure its success, and it has definitely paid off, thankfully. I’ve got several posts on my blog about our garden if you’ like to take a look. Here’s the most curren update, with lots of pics.